All of the craftsmanship and versatility of the 6X10 model. Designed for smaller clubs where 70 powerful watts are all you need. 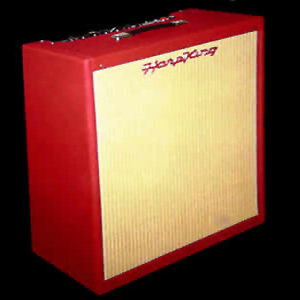 Our 4X10 has the three famous "KINDER CONTROLS" for harp tone and feedback control. A fine harp amp with lots of "bottom end." Color choices: Red, Purple or Blond new with black silk-screen on faceplate. All of the HarpKings come with wheat or custom grille cloth.